Fruit of Physalis alkekengi var. 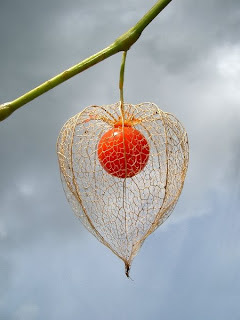 franchetii, the Chinese lantern plant. In species of Physalis, the persistent calyx that is characteristic of Solanales has become greatly expanded to form a protective covering for the (rather tasty!) fruit. Photo from here. While intrafamilial relationships among flowering plants have a reputation for being contentious, one concept that has long been supported by most authors is a close connection between the Solanaceae (nightshades) and the Convolvulaceae (morning glories). Originally united on the basis of features such as similar flower structure and internal phloem in most species (the phloem is the nutrient-carrying tissue in a plant's stem, and in these taxa it is found mixed in with the central water-carrying xylem as well as around the outside of the stem as in other plants), molecular analyses have continued to support their relationship (Bremer et al., 2001). In the most recent APG classification, the two families form the greater part of the order Solanales, along with three smaller families - Montiniaceae (a family of trees and shrubs found in southern Africa and Madagascar) and the isolated genera Sphenoclea and Hydrolea (two pantropical families of small shrubby plants both found growing near or in water) (APG II, 2003). 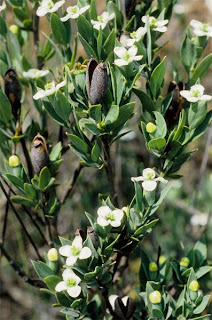 Montinia caryophyllacea, a shrub of the Montiniaceae found from South Africa to Angola. Photo from Aluka. The three small families, which remain outside the Solanaceae-Convolvulaceae clade (which I'll call the "core Solanales"), are placed in the Solanales largely on the basis of molecular analyses only, and so far few or no morphological features have been identified that support their referral. Peter Stevens' Angiosperm Phylogeny Website does suggest a couple of features - some shared secondary metabolites, and the fact that the calyx persists on the mature fruit (you've all seen this - it's the sepals around the stalk of a tomato). Erbar et al. (2005) identified features of flower development shared between Hydrolea and the core Solanales, but not the other two families. Most Solanales are, like other members of the Asteridae clade to which they belong, sympetalous - that is, the petals are to some degree joined together at their base. One of the distinctive features of many Convolvulaceae and Solanaceae flowers, in fact, is that they take sympetaly to its extreme - the petals are entirely fused to form a bowl or trumpet. However, while the core Solanales and Hydrolea are "late sympetalous", where the petals initially start growing separately in the bud and are only joined later by the growth of connecting bridges, Sphenoclea is "early sympetalous", where the petals are connected pretty much right from the start. Montiniaceae are not sympetalous at all, but have entirely separated (and not very big) petals. Kumara or sweet potato, Ipomoea batatas. Photo from here. Within the core Solanales, the Convolvulaceae are mostly vines (though the basalmost member of the Convolvulaceae, Humbertia madagascariensis, is a large tree), while the Solanaceae range from small herbaceous plants to large trees. As well as being a tree, Humbertia also differs from other Convolvulaceae in lacking internal phloem. This is intriguing, because Humbertia's sister relationship to all other Convolvulaceae means that it is just as parsimonious for internal phloem to have developed independently in the two families as for it to be a true synapomorphy of the core Solanales. 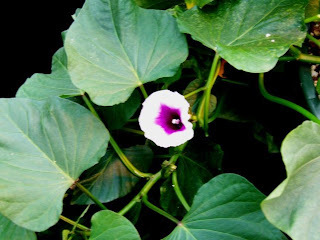 The herbaceous vines of the Convolvulaceae are commonly referred to as morning glories, referring to the time of opening of their large but often short-lived flowers, but other common names are just as evocative - trumpet vine, or railway creeper (the latter because many species have become widely distributed as adventives inadvertently carried by human activity). They are also, somewhat less poetically, known as bindweeds. One such plant, Ipomoea batatas, grows large tubers that are the world's second-most important root crop, the sweet potato (Stefanović et al., 2002). 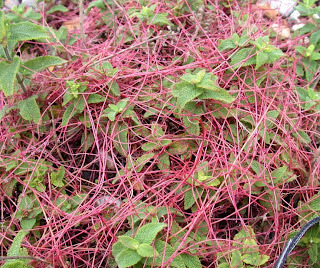 Dodder, Cuscuta epithymum, overgrowing a sage plant. Photo from Kingston University. One particularly distinctive genus of Convolvulaceae are the dodders, Cuscuta, twining parasites of other plants. Dodders contain little or no chlorophyll of their own, and their roots degenerate early on in life so the mature plant is not connected to the ground. The leaves are minute, and one might be forgiven for thinking that they were not there at all. Cuscuta has been placed in its own family in the past, but most of the characters this has been based on are uniquely derived features resulting from its parasitic lifestyle. Neyland (2001) and Stefanović et al. (2002) confirmed that Cuscuta is nested among normal photosynthetic Convolvulaceae. Cuscuta also provides a remarkable example of convergent evolution - in its general appearance, it is almost indistinguishable from the genus Cassytha, also commonly called "dodder". Cassytha, however, is not closely related to Cuscuta at all, but is instead a member of the distant family Lauraceae, and so more closely related to magnolias. The Solanaceae also include a number of significant taxa. As a group, most Solanaceae are decidedly toxic (at least from a human perspective), and the family includes such infamous plants as deadly nightshade (Atropa belladonna), Jerusalem cherry* (Solanum pseudocapsicum) and Jimson weed (Datura stramonium). On the other hand, the family also includes a number of plants widely grown for human consumption, such as potatoes (Solanum tuberosum), tomatoes (Solanum lycopersicum**) and eggplants (Solanum melongena). A few Solanaceae manage to be both toxic and grown for human consumption - most notably good old tobacco (Nicotiana tabacum). The question arose recently at the Te Papa blog as to whether the common black nightshade (Solanum nigrum) is toxic or not - while it is widely supposed to be, it is actually eaten in some parts of the world (Edmonds & Chweya, 1997). Fruit are eaten when ripe or cooked (the huckleberry of North America is either Solanum nigrum or a close relative), while leaves are boiled and eaten as a pot herb. It seems that, just to confuse matters, toxicity of this plant varies from place to place. *No, I don't know why they're calledd that. **For those who are wondering what happened to 'Lycopersicon esculentum', it has been well established that 'Lycopersicon' species fall phylogenetically within Solanum (as Solanum section Lycopersicum), and in fact are very closely related to potatoes (somatic hybrids between potatoes and tomatoes have been succesfully produced, though it looks like produce-wise they're a bit of a second Raphanobrassica***). If the tomato is included in Solanum, then its name reverts back to that originally given to it by Linnaeus way back in 1753. ***Raphanus (radishes) and Brassica (cabbages) are also closely related to each other, and a lot of time and effort was invested by the early Soviets into producing a hybrid between the two that would possess the root of a radish with the leaves of a cabbage - two crops for the price of one! The Raphanobrassica cross was successfully produced in the 1920s - sadly, it turned out to have the root of a cabbage and the leaves of a radish. APG II (Angiosperm Phylogeny Group). 2003. An update of the Angiosperm Phylogeny Group classification for the orders and families of flowering plants: APG II. Botanical Journal of the Linnean Society 141: 399-436. Bremer, K., A. Backlund, B. Sennblad, U. Swenson, K. Andreasen, M. Hjertson, J. Lundberg, M. Backlund & B. Bremer. 2001. A phylogenetic analysis of 100+ genera and 50+ families of euasterids based on morphological and molecular data with notes on possible higher level morphological synapomorphies. Plant Systematics and Evolution 229: 137-169. Edmonds, J. M., & J. A. Chweya. 1997. Black nightshades. Solanum nigrum L. and related species. Promoting the conservation and use of underutilized and neglected crops 15. Institute of Plant Genetics and Crop Plant Research, Gatersleben/International Plant Genetic Resources Institute, Rome, Italy. Erbar, C., S. Porembski & P. Leins. 2005. Contributions to the systematic position of Hydrolea (Hydroleaceae) based on floral development. Plant Systematics and Evolution 252: 71-83. Neyland, R. 2001. A phylogeny inferred from large ribosomal subunit (26S) rDNA sequences suggests that Cuscuta is a derived member of Convolvulaceae. Brittonia 53 (1): 108-115. Stefanović, S., L. Krueger & R. G. Olmstead. 2002. Monophyly of the Convolvulaceae and circumscription of their major lineages based on DNA sequences of multiple chloroplast loci. American Journal of Botany 89 (9): 1510-1522. Fascinating! I never realized all these were related! Missing in your list of edibles, is a "green tomato" (tomatillo, Physalis philadelphica) popular in Mexico. It's not a tomato at all, but something halfway between the Chinese lantern and a tomato. It's pale yellow or sometimes green and purple when it's ripe, and almost completely wrapped in the calyx. I've been wondering about the Chinese lantern, whether it was edible or not. I am never quite sure of things in this family. I'll try the next one I see. There are sveral species of Physalis I believe - I have seen seeds of at least one sold under the name "Chinese Gooseberry"
I thought the "Chinese gooseberry" was a kiwi. I just Googled it, and found the Physallis; a fruit like the Chinese lantern, from Peru. Physallis peruviana; obvious name. Another name for it, in Spanish; aguaymanto, or cloaked water. The "Chinese gooseberry" is indeed a kiwifruit, though the original Chinese gooseberries were quite a bit smaller than the modern kiwifruit, like the difference between a crab apple and an apple (being a New Zealander, I'm always vaguely bemused by the use of the word "kiwi" alone to refer to the fruit rather than the bird. I had some very strange mental images pop up the other day when I saw a sign advertising "kiwi juice"). Physalis peruviana is the Cape gooseberry, grown in many a garden back home, and was the Physalis I had in mind when I referred to their tastiness. Why they should be called Cape gooseberries if they come from South America I've no idea ("Cape" by itself usually indicates Cape of Good Hope). I've heard of tomatillos, but I've never encountered one in the flesh - nor a Chinese lantern for that matter. I just looked up whether Chinese lanterns are edible - apparently they are, as long as they're fully ripe. While we're on the subject of confusing common names, the "Chinese lantern" that I've always been familiar with is also very different plant. They huckleberries of western North America are Vaccinium (Ericaceae), not Solanum (Solanaceae). Of course, that doesn't mean some Solanum species aren't called "huckleberry" somewhere. Common names do vary. I remember hearing that Jerusalem and Christmas Cherry were just names invented for marketing the plants as Xmas ornamentals. That Canadian Poisons website you linked to also mentions that P. peruvianus is poisonous when unripe. I wonder if commercial producers know this? I have had a few green ones but didn't eat them. The ripe fruit do contain withanolides so you have to be careful, a large meal can be sedative and aphrodisiac. Like the Ashwagandha, Withania somnifera. The tomatillo (though the seeds were sold to me as P. ixocarpa) is delicious. It is supposed to be the basis of salsa in Mexico, rather than tomatoes. Though I ate it raw the other four members of the household took one bite and declared it disgusting. So they wouldn't eat it cooked when it became even more wonderful. They produce masses of fruit, breaking their own branches with the weight. I have just remembered that the first Cape Gooseberries I had were canned ones from South Africa in about 1973. See the Wikipedia entry for a little info on them.